Rod Hall Products is an authorized dealer of Fox Shox and genuine Hummer H1 parts. 779, Andy, will be starting first. 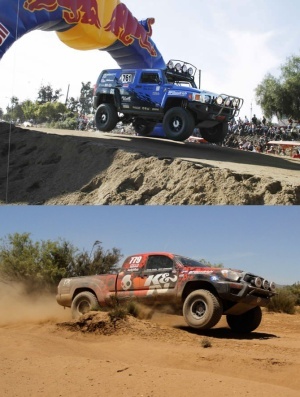 The Toyota Tacoma received a full makeover from Long Beach Racers with a TIG welded, SCORE approved roll cage with the Long Beach Racers trademark "low profile" rear cage design to keep the rear view clean. This high tech roll cage will be joined by custom Bilstein 60mm race shocks and 35-inch BFGoodrich Project Tires on 16-inch TRD Baja Series wheels. Hella HID lights on custom mounts on the bumper will help lights the way while PCI Race Radio and intercom systems in place of the exterior mirrors will facilitate communication. 762, Rod, vehicle information has not yet been located online.